A limited edition 7-disc trilogy collector's set will also be available at the end of January. 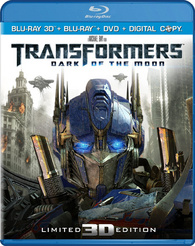 As previously reported, Paramount has revealed 'Transformers: Dark of the Moon - 3D' for Blu-ray on January 31. A must-own film for every home media collection, 'Transformers: Dark of the Moon' features “jaw-droppingly amazing 3D” (Harry Knowles, AintItCool.com) and fan-favorite characters Optimus Prime, Bumblebee and Sam Witwicky amidst bigger and more spectacular action in an adventure that surpassed its predecessors to earn over $1.1 billion at the worldwide box office and become the #4 biggest movie of all time at the global box office. And, for a limited time, all three eye-popping films in the 'Transformers' franchise will be available in a 7-Disc Limited Collector’s Edition Blu-ray Trilogy featuring each film in high-definition, 'Transformers: Dark of the Moon' in high definition 3D, more than 10 hours of special features and a plaque of movie images signed by Bay. Suggested list price for the Blu-ray 3D combo pack is $39.99 while the trilogy collector's set is $99.99. You can find the latest specs for 'Transformers: Dark of the Moon - 3D' linked from our Blu-ray Release Schedule, where it's indexed under January 31.